Documentary location photography chronicling Horizontal Directional Drilling (HDD) construction method practiced by client, Tru-Line Civil. 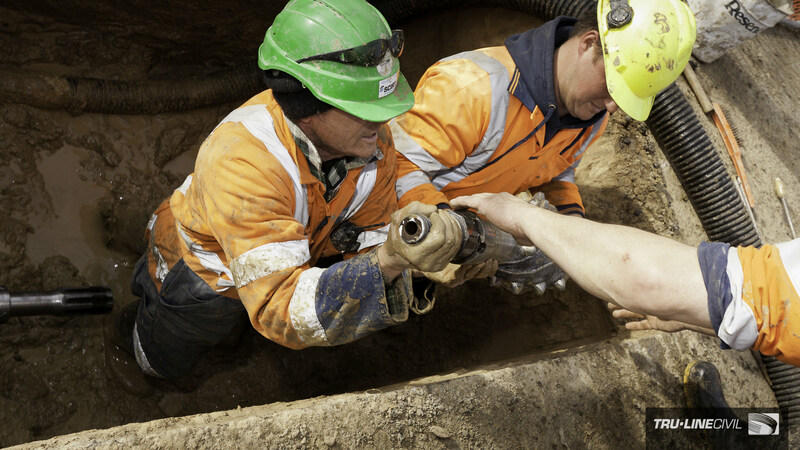 This “trenchless technology” slideshow documents the drilling of a pilot bore and the subsequent back-reaming of a 120m long drinking water supply pipeline up to the summit of Coachmans Road, Akaroa—a small very busy tourist destination located on scenic Banks Peninsula in the South Island of New Zealand. Summit of Coachmans Road Akaroa. The HDD drilling unit operator Grant Senior, with the the pilot bore entry trench to the left. Akaroa Harbour basin and the township form the backdrop.. 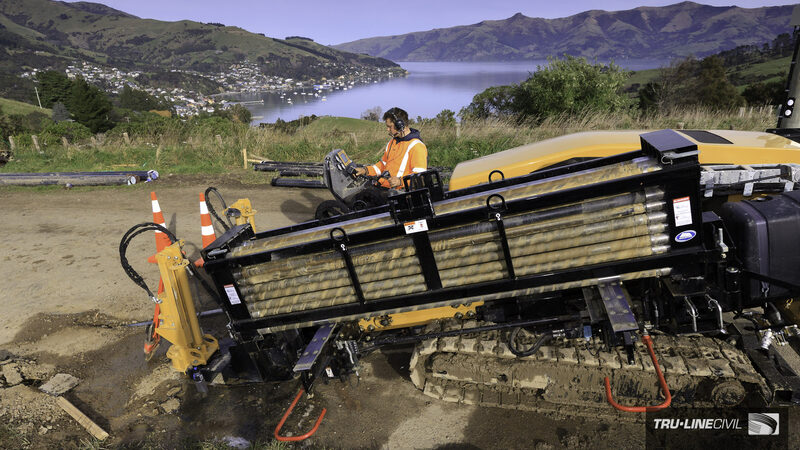 The HDD drilling and back-reaming was a sub-task of the Akaroa Water Supply Stage 3, Reticulation Upgrade carried out in 2014 by Tru-Line Civil for the Christchurch City Council (sub-contracting to Hawkins Infrastructure). The 180mm ø pipeline is designed to carry treated drinking water pumped up from a new water treatment plant and pump booster station on the slopes of Coachman’s Road to a new 500 m³ reservoir situated on the ridge between Akaroa and Takamatua. This day of shooting is part of a larger, long term project which I commenced for the client in 2008, to produce a high quality image archive of their construction methods and completed projects—the photos are both of historical significance to Tru-Line Civil and for immediate use to illustrate the civil engineering case studies, like the Akaroa HDD case study I researched and co-wrote on their website and the competitive tender bid documents that are produced as part of their day-to-day operations. The crew detach the back reaming head from the drill stem and remove it from the entry trench prior to relocating the HDD drilling rig to the next drill site for the day. The photojournalistic objective is always to produce a series of truthful, descriptive, and candid photos of two broad subjects; Tru-Line’s Civil Engineering projects and the disciplines and methodologies used to complete them. The work is objective, I learn about the subject so I may anticipate and flow with the action on the day. Due to the nature of the Civil Engineering and Drainlaying industries, documenting their methods most often involves pictures of people, specifically men, at work, using tools and skilfully operating vehicles and heavy equipment. Civil Engineering will always involve moving dirt, the design, planning and building of structures like bridges, infrastructure, water supply systems and roads. Modern, affordable earthmoving plant and new technologies like HDD are revolutionising the industry in ways most engagingly shown via photography and video. Combined with modern methods, materials and large civil works programmes such as the Christcurch post-quake rebuild, involve water and sewage reticulation networks and the roll-out of Ultra-Fast Broadband. Civil engineering is a very engaging and rewarding subject to document as a photographer. Summit of Coachmans Road, Akaroa. The HDD drilling unit and operator, entry trench and the supporting equipment needed to assist directional-drilling to work smoothly. Akaroa Harbour basin and the township of Akaroa are the backdrop of the panoramic view.